I'll be taking over Morning Shift duties for Matt temporarily while he and Travis are on their SRT adventure down to SXSW in Austin. Feel free to make your own gears in the comments that we can star to the top. With that said, get your tin foil hats ready because it's time to read the news. According to data from R.L. Polk & Co., no domestic brand was among the top 10 with the highest percentage of female buyers; Mini, Kia, Nissan, Honda and Fiat topped that list. In fact, Buick was the only domestic make that topped the industry average of female buyers: 39.3 percent of Buick buyers were women; the average for the industry was 38.8 percent. 2nd Gear: Louisiana, Land Of The Mega Commuters! The U.S. Census Bureau yesterday released its latest data on commuting, and it ranked people in Louisiana as being "among the most likely mega commuters," according to U.S. News and World Report. Any truth to this, Louisiana readers? Nearly 6 percent of people who work in Houma, La., make a 90-minute, 50-mile journey to work, along with nearly 4 percent in New Orleans and over 3 percent in Lafayette. By comparison, less than 1 percent of all commuters nationwide are mega commuters. Akio Toyoda on Wednesday announced some pretty big changes to the management of his family's company, according to the Los Angeles Times. Toyoda will remain on as president and board member (which is good news for us because he's a motorsports guy and an all-around enthusiast) while board chairman Fujio Cho will be replaced with Takeshi Uchiyamada, the executive who brought the Prius to market. These changes will also make the brand's North American arm much more autonomous. Akerson also told Automotive News that the death of the V8 has been "greatly exaggerated" thanks to cylinder deactivation technology, direct injection and turbos. That's good to hear. The 4C will deliver 240 hp from its 1.75-liter, turbocharged, direct-injection gasoline engine and top out at 155 mph after speeding from zero to 60 mph in about 4.5 seconds. "These numbers underline the supercar status of the 4C," Wester said at a mobbed Alfa Romeo stand at the Geneva auto show today. The story does note that at an estimated $60,000 to $80,000 price tag, it is more expensive than some European two-door rivals, particularly the Porsche Cayman. 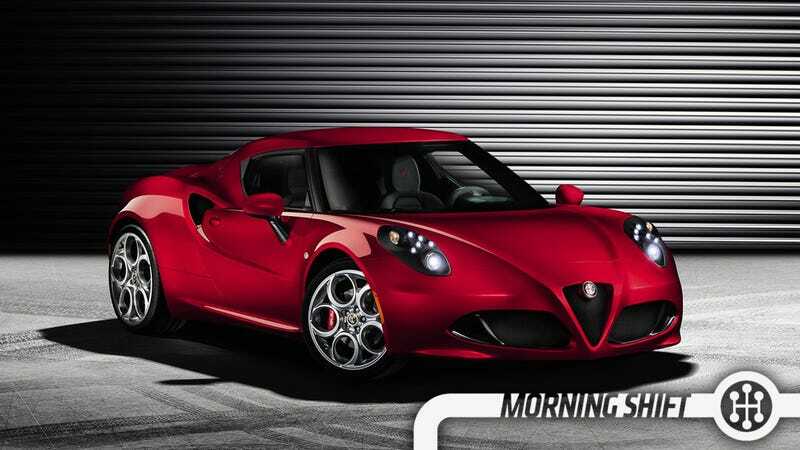 The car 4C is the first model unveiled under Fiat-Chrysler CEO Sergio Marchionne's plan to revamp the unprofitable-but-storied Alfa brand. Let's just hope they can cut down on some of the cheap-looking parts our man Mate Petrany found in Geneva.